The Fall 2017 Commencement was an amazing event with a packed house! The ceremony took place on Sunday, December 17th, welcoming more than 700 new grads to our growing list (more than 100,000!) of YSU Alumni! 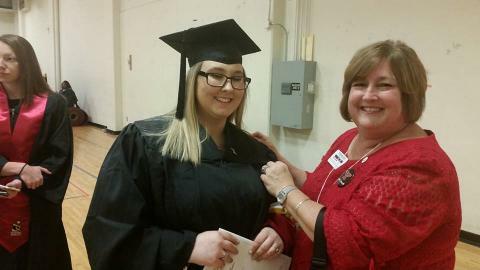 Below: An exciting moment...Pete's Pride member, Mary Mathews Bebech, presents a new graduate with her YSU Alumni pin!